The knock on these types of helmets is their increased heat and lack of wind. 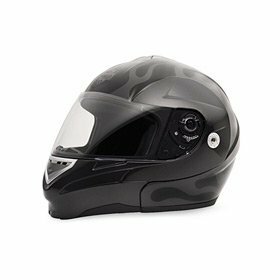 This helmet attempts to address that with built-in air channel grooves and a wicking liner to keep the rider's head dry and cool. The removable face shield provides clear visibility. The flames and Harley logo on the helmet are a subtle gray. This motorcycle helmet meets DOT requirements. Also included is a helmet bag. The drawback of ordering a helmet on-line, of course, is that you can't check it for a proper fit before ordering -- be sure to check the vendors return policy. The seller I'm linking to on Amazon has a reputation for excellent customer service.